We specialize in heating and air conditioning repair, insulation, plumbing and other home maintenance services; making your home both comfortable and functional. We never charge for an estimate for any of our home services. Book your appointment for AC repair, plumbing, insulation & heating and cooling equipment installation in the Phoenix area now! From every AC repair, every HVAC installation, every home services project to every plumbing job - always done right the first time. Isn't that what you'd expect from Phoenix's leading home services team? Find out the difference an Orangutan expert makes. Hey Phoenix residents - did you enjoy your air conditioning or plumbing repair experience with Orangutan Home Services? We offer referral bonuses and special promotions to our home service customers who speak highly of us. Find out more about our referral program now. We are a total home service company. We specialize in heating and air conditioning repair, maintenance, and installation services and also provide plumbing, attic solutions (insulation and Aeroseal) and home security systems. Click here to find out more about our comprehensive HVAC services. 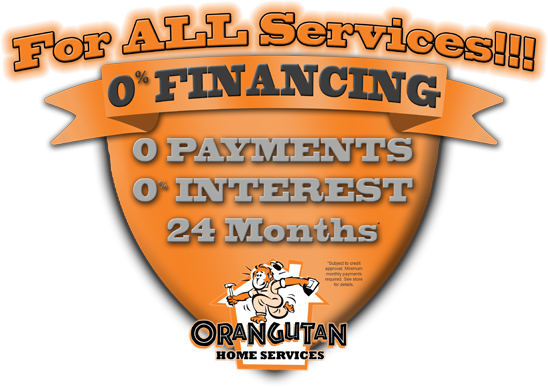 Orangutan has been the most-awarded Arizona heating and air conditioning service company since 1993; offering AC repair, installation and maintenance as well as heating repair and other HVAC services. Our highly-trained expert technicians deliver unparalleled heating and air conditioning repair and services within the Arizona cities of Phoenix, Tempe, Scottsdale, Tucson and their surrounding areas.